Home / Category Name: Easter Eggs and Icons, Category Path: Easter Eggs and Icons / Nesting Easter Eggs 5pc./4in. What fun for youngsters to find a set of brightly colored nesting eggs in their Easter Basket! 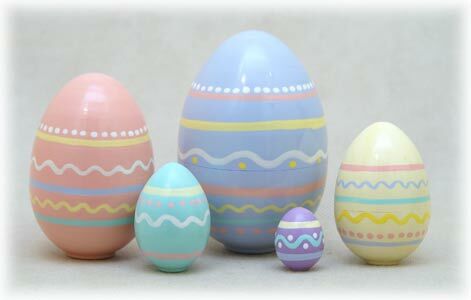 Hand painted wooden Easter eggs can hold treats or stand alone as your holiday table centerpiece. As a unique version of a Russian nester it would be a well received gift any season for the matryoshka collector. A great matryoshka for spring! Easter Bunny Nesting Egg 5pc./4in.